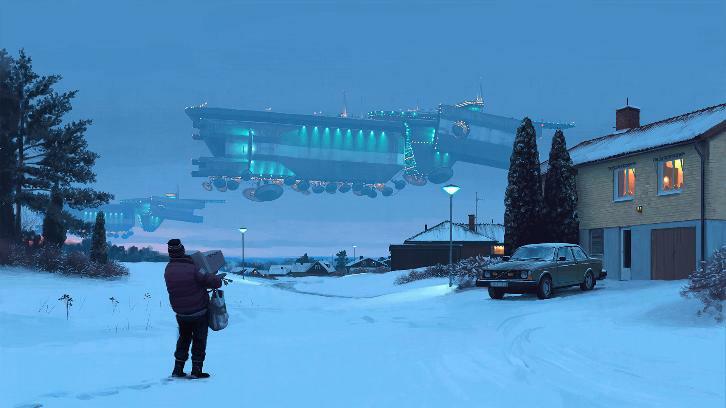 Amazon has given an eight-episode series order to Tales From the Loop, a drama based on artwork (as seen in the header above) by Simon Stålenhag. Nathaniel Halpern (Legion, Outcast) will serve as showrunner and executive producer per The Hollywood Reporter. Mark Romanek (Never Let Me Go) will direct the pilot episode and executive produce also. Per Deadline, based on the acclaimed art of Swedish artist Stålenhag, Tales from the Loop explores the town and people who live above “The Loop,” a machine built to unlock and explore the mysteries of the universe – making things possible that were previously relegated only to science fiction. In this fantastical, mysterious town, poignant human tales are told that bare universal emotional experiences while drawing on the intrigue of genre storytelling. "Simon Stalenhag's paintings are renowned for their vision of a not-too-distant, futuristic landscape. We are looking forward to bringing that to life and sharing it with our Prime Video audience,” said Albert Cheng, co-head of television at Amazon Studios. "Nathaniel is a gifted storyteller who shares our passion for creating soulful, human stories that push the boundaries of genre programming and we’re thrilled to be working with him on this series,” Yguado said. “I was immediately intrigued by the idea of bringing Stalenhag’s incredible paintings to life, but it’s Nathaniel’s deeply inspired vision for this world, and the stories he has created from an incredibly passionate and emotional place, that will drive this series and its storytelling. Together with Mark’s brilliant visual sensibility and unique point of view, it makes this a truly exceptional project and the perfect one to partner with Amazon in our studio’s first direct-to-series order at the streamer,” said Jane Francis, executive vp at Fox 21 Television Studios.